If you’re a homeowner facing some upcoming big expenses like college or home improvements, a Home Equity Line of Credit (HELOC) may be just the solution. A HELOC is a line of credit that allows you to borrow against the value your home has built up. It’s open-ended, so you can withdraw only the money you need as you need it within a specific time period. Borrow any amount up to your credit line at any time within 15 years, subject to terms of the account agreement and you only pay interest on the amount advanced. If you have an LGFCU mortgage, you can borrow up to 90 percent of the appraised value of your home, minus the amount owed on your mortgage. If your first mortgage is not with LGFCU, you can still get an LGFCU HELOC, with the ability to borrow a maximum of $100,000 or 90 percent of the appraised value of your home minus the amount owed on your mortgage, whichever is less. Your HELOC can provide overdraft transfer service for your LGFCU Checking Account, and interest payments may be tax deductible; consult your tax advisor. You can access more cash even faster with a real-time loan advance from your HELOC. If you have an existing LGFCU HELOC you may be able to lower your interest rate to the current rate for new HELOCs. To qualify your first mortgage must be with LGFCU or the HELOC must be the only mortgage on your property. You may need to complete the Home Equity Line of Credit Modification Form and bring it to the nearest branch. You can also get a lower rate when you choose to repay your HELOC through ACH funds transfer or Payroll Deduction. Only primary residences are eligible, and the property must be in North Carolina, South Carolina, Virginia or Georgia. 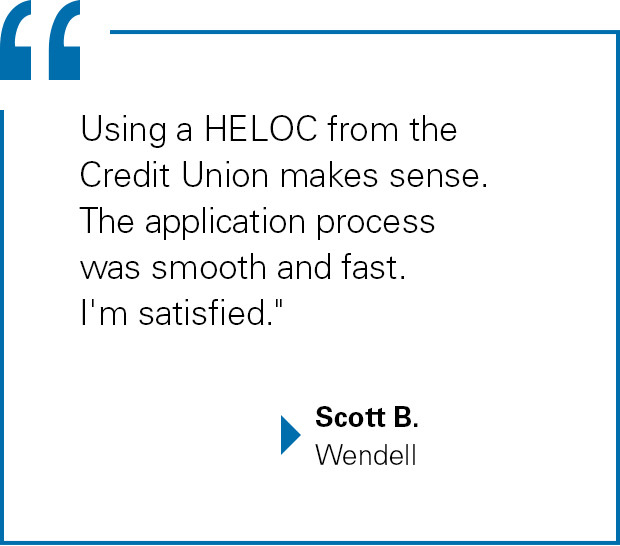 A HELOC is a good solution for a one-time major expense. Enjoy the flexibility of having the cash you need, when you need it! Apply for a Home Equity Line of Credit today. * The APR (Annual Percentage Rate) is based on the current index plus a margin. The current payroll deduction/funds transfer rate is 4.75% APR when the mortgage is with LGFCU, or if there is no first mortgage. Direct pay is 0.5% higher (5.25% APR). When a home equity line of credit is second to a mortgage with another lender, the current rate for payroll deduction/funds transfer rate is 5.50% APR. Direct pay is 0.5% higher (6.00% APR). The APR is a variable rate, subject to change quarterly. The index is based on the 26-week Treasury bill rate for the quarter, and is set on or after the 15th day of the second month after the end of each calendar quarter adjusted up to the nearest 0.25%. The maximum quarterly rate adjustment is 0.50%. Over the life of the loan the maximum APR will be the initial rate plus five percentage points or 12.75% APR, whichever is higher, but never more than 18% APR. The payment amount will change if the APR changes. Costs and fees associated with a HELOC may range from $0 to $1,600. HELOCs are only available in North Carolina, South Carolina, Virginia and/or Georgia. Improve your home for less!